If catching a live concert is what you want to experience some day in Japan, then this is the entry for you. I used to wonder how and where do I purchase concert tickets until some many many years ago, I came to browse a New Yorker’s blog on his adventures attending concert after concert during the time when I was in to Japanese visual rock. I became a fan because he catches practically nothing but visual rock concerts which was really interesting for me. Even more so because he seems to be able to get behind the scenes and snap a couple of pictures with the band members. 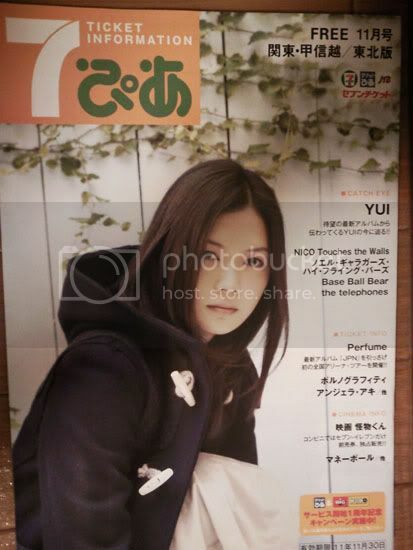 Then, he mentioned about ticket Pia (ぴあ) and yesterday, I finally grabbed a copy off 7-eleven (mainly because the cover looked pretty good with Yui on it). It’s free, by the way. In this November issue lists a whole calendar of concert events and ticket sales information for November and December. Of course, if you still can’t get your hand on a copy of this, you can always visit the website here. Needless to say, you can find a lot more concert information on the site itself. However, with the amount of information, it’s kinda difficult to locate what you want unless you have something in mind. On a side note, you probably can’t find Arashi tickets or Johnny’s tickets for that matter, because from what I heard, their tickets are only available to members of their fan club. And to be a member of their fan club, you have to have an address in Japan. Also, each member is only allowed to purchase 4 tickets max. Well, I haven’t gone to any concerts yet but hopefully I will some time soon. lol. well actually, Johnny’s has started to sell some of their tickets internationally, so fans can actually try their luck at the Johnny’s International website. you won’t find Arashi there, though. Great information! Though I’m not a Johnny’s fan, nevertheless, thanks for sharing. Maybe I can find something I like there too.